Most people have had a suspect power bill a time or two, but $170,000-worth of suspect power bills? The museum ship Salem in Salem, Mass., is haggling with the power company over $170,000 of unpaid electric bills and National Grid is threatening to cut off the lights. 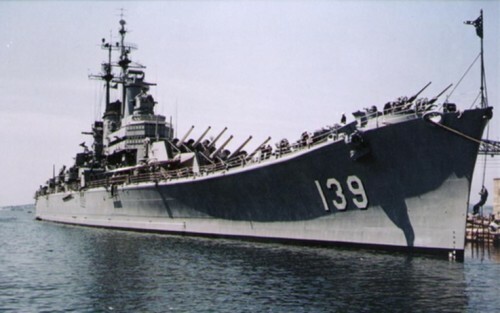 The heavy cruiser that once served as the 6th Fleet flagship in the Mediterranean has been docked in Salem as a floating museum since 1994. The Salem didn’t use the power for which it’s being charged, Condon said. He said the power was used by Bluefin Robotics Corp., a company that once rented space next to the Salem at the former Fore River shipyard. Bluefin’s president said that is not the case, but Condon insisted that Bluefin plugged into the Salem’s electricity to power its equipment and trailers. Because the Salem’s name is on the electricity meter, the ship is being saddled with the charges, Condon said. “Even the people trying to collect the money from National Grid readily admit it’s not our bill, but they want us to chase (Bluefin). With what army am I going to go chase them?” he said. Bluefin disputes the director’s claim, saying in a statement that all utility bills had been paid in full. Ugh. What a mess. If nothing else, a good walkdown of the facilities should have revealed somone leeching utilities. Walkdowns happen on a regular basis for security and safety purposes. Hope it gets settled fairly.